Presenting to you another versatile HelloFresh 'one pot wonder'! 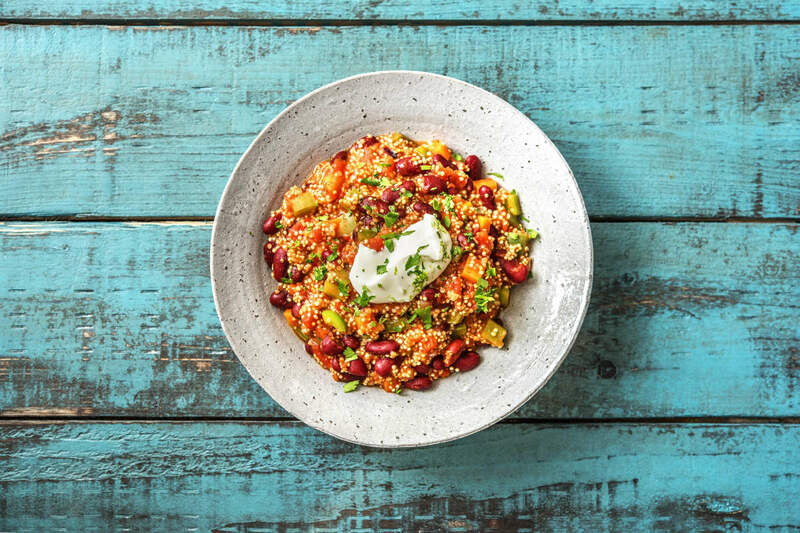 This delicious dish has a bit of a twist - quinoa, cooked in the same pot as the chilli! It provides all the flavours you'd expect from a chilli but with some added cinnamon tones and a nutty texture. Kidney beans and plenty of veg make it a hearty and nutitious meal. Go for it! Halve, peel and chop the onion into roughly ½cm pieces. Peel and grate the garlic (or use a garlic press). Halve, then remove the core from the green pepper and chop it into ½cm squares. Peel the carrot and remove the top and bottom, then chop into ½cm cubes. Roughly chop the coriander (stalks and all). Drain and rinse the kidney beans in a colander. Heat a splash of oil in a large saucepan over medium heat. Add the onion. Gently fry until soft, about 3 mins. Add the pepper and carrot. Gently fry for a further 3-4 mins. Add the garlic, cumin, cinnamon and chilli powder (go easy if you don't like it too spicy!). Stir to coat and fry for another 30 seconds. Add the water (amount specified in the ingredient list) to the pan along with the vegetable stock pot. Stir to dissolve the stock pot, then add the quinoa, kidney beans, diced tomatoes and tomato purée. Season with a pinch of salt and a good grind of black pepper and stir everything together. Bring your chilli to the boil and then reduce to a simmer. Cover with a lid and cook until the quinoa is tender, about 15-20 mins. Zest the lime into the sour cream together with a pinch of salt and a good grind of black pepper. Place the cornflour in a small bowl and add an equal amount of cold water. Mix with a fork until the cornflour has dissolved. Tip: This is called 'slaking' the cornflour. It makes a mixture called a ‘slurry’ which doesn't sound very appetising but is very helpful for thickening a sauce, soup or stew! Add three-quarters of the coriander to the chilli and stir through. Whisk the slurry again and add it to the chilli, stirring continuously. Gently heat, stirring, until slightly thickened, about 30 seconds. Remove from the heat and serve the chilli in bowls topped with some sour cream. Sprinkle over the remaining coriander and tuck in!